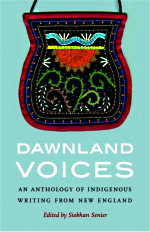 This anthology is an in-depth journey to indigenous New England, published in 2014 by University of Nebraska Press. I am honored that nine of my poems appear in the collection, along with many other indigenous writers historians, and storytellers, mixed genre writing from indigenous people all over New England (Ndakinna, Abenaki for The Land). The anthology, edited by Professor Siobahn Senier of the University of New Hampshire, includes contemporary authors Joseph Bruchac, Cheryl Savageau, Lisa Brooks, Alice Azure, and others. Nowhere else will you find such a massive a gathering of Indigenous New England's past, present, and future. This book is recommended reading for the curious, the academic, and for any reader who wants to know more about indigenous culture here in Ndakinna. Readers will find tribal and historical documents as well as poems, plays, essays, and stories. Follow the link in the sidebar to order directly from University of Nebraska Press.